Sometimes the story behind a movie can bring an angle to what's on the screen. 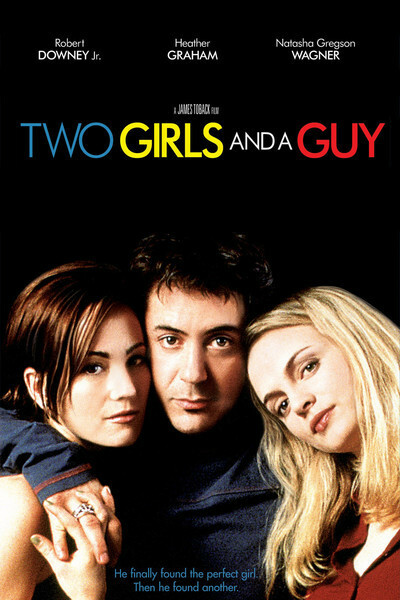 Consider “Two Girls and a Guy,” written and directed by James Toback, and starring Robert Downey Jr. The story involves a two-timing actor who returns to his Manhattan apartment to be confronted by both of his girlfriends, who've just found out about each other. Here's the background: * Toback and Downey worked together before, in “The Pick-Up Artist” (1987), where Downey played a compulsive womanizer who bounded through the streets of New York, fast-talking pretty girls. He was a cad and a liar, but likable; Pauline Kael wrote that “Downey, whose soul is floppy-eared, gives the movie a fairy-tale sunniness.” * James Toback himself is, or was, a notorious pickup artist. How notorious? The late Spy magazine once printed a double fold-out chart of his activity during just one month. With the names of his female targets running down the left-hand side of the page, the magazine used a grid to chronicle his various approaches, and how many of his favorite pickup lines (“I work closely with Warren Beatty”) he used on each woman. * When Downey was shown on television, being led to jail in handcuffs on drug charges, Toback was watching, and says he sat down immediately to write a screenplay for his old friend. “When I saw him in that orange jail jump suit, I knew he was ready to play this role,” Toback told me at the 1997 Toronto film festival. Of course, perhaps Toback (whose screenplays include “The Gambler” and “Bugsy”) was also ready to write it; the film is confessional and contrite. * “Two Girls and a Guy” was written in four days and filmed in just 11, mostly inside a single apartment in SoHo. Not long after, Downey went back to court and eventually to jail, only to be released this month. Downey is not floppy-eared or sunny in this film as Blake, but he is resilient and unbowed. Confronted with both of his girlfriends, Carla (Heather Graham) and Lou (Natasha Gregson Wagner), he talks and thinks quickly, saying he meant it when he told them both he had “never experienced real love” before. “He decided consciously to start with both of us at the same time!” Lou says. And as they work it out, it appears he did meet them at about the same time. He saw each girl three nights of the week, excusing himself on the other nights because of the illness of his mother, who neither one ever met. The two women meet on his doorstep, break into his apartment and are hiding there when he returns from a trip and leaves phone messages for them both. When he sees them, he's at a loss for words, but soon they come tumbling out; Toback in person is a torrential talker, and here Downey is as persuasive as a snake oil salesman and Wagner (Natalie Wood's daughter) fires out high-energy dialogue like Robin Williams. What can be said, really? He's a cheating, lying SOB, and both women find even more colorful terms to describe him, both as a person and in terms of his various parts. The movie is essentially a filmed stage play, one of those idea-plays like Shaw liked to write, in which men and women ponder their differences and complexities. Is it true that men are polygamous by nature? It's much more complex than that, the movie suggests, especially after Lou suggests that her interest in Blake might expand to include Carla. Downey, whatever his problems, is a fine actor, smart and in command of his presence, and he's persuasive here as he defends himself: “I'm an actor. And actors lie.” There is a show-stopping scene when he looks at himself in a mirror and warns himself to get his act together. There are some notes in the movie that I could have done without, including an offstage gunshot and a tearjerker ending. But I enjoyed the ebb and flow of their time together.